Like with any pet, finding a breeder for red toy poodles that is both reliable and trustworthy isn’t always easy. It can be confusing to wade through the different options online to seek who is legitimate and who is not. In addition, being able to sign a contract that answers your needs, as well as the dog’s, is something that takes a significant amount of research beforehand. But believe us—here at Scarlet’s Fancy Poodles, we know that finding the right breeder can mean all the difference. Puppy mills are facilities where a majority of pet stores get their pets from, and they are widely known in the industry for their cruel and negligent treatment. Buyers will find this out later, and, unfortunately, it often carries a serious emotional toll. In all occasions, a breeder is preferred over these facilities so avoid them at all costs. There are also a number of non-legitimate breeding websites out there that posit as a breeder who cares, when, in fact, their practices mirror a puppy mill’s. Don’t be fooled—see what people say online, on review sites, or in testimonials about the breeder in question, and then decide from there. To avoid such conflict, it’s often recommended to look locally for a breeder, as people you know and trust can vouch for their services. As with any contract, you’re going to want to understand the terms and conditions that you’re lending your signature to when purchasing a red toy poodle. Sometimes, breeders will include clauses that allow them to have a say in a major decision, like neutering or spaying the dog that some owners may not want. In other occasions, the buyer will be held accountable for taking care of the dog’s health. Whatever the situation may be, just make sure the contract you’re agreeing to balances the demands of yourself, the breeder, and, most importantly, the new red toy poodle you’re taking home. Last but not least, finding a responsible breeder is integral. These breeders are usually diehard dog fans, who are only breeding these dogs for their own betterment, rather than profit. A breeder will make this clear by the environment the dogs are raised in, and the health guarantees included in their contracts; this shows that the breeder really does care about the puppy they’re selling to you, which should give you peace of mind. For help, we recommend asking veterinarians, kennel clubs, or other dog owners for suggestions. 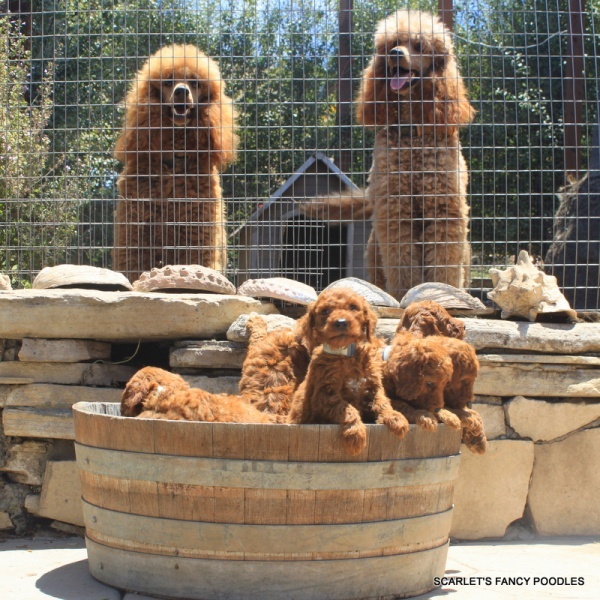 Once you’ve taken these factors into consideration, we hope you’ll visit Scarlet’s Fancy Poodles, where every day, we work to find red toy poodles the homes and owners they deserve in the Central Coastal California area! Are You Purchasing from a Quality Breeder? 12pm - 3pm. Visits are by appointment. Closed all major holidays.